Work to market Summers Quay, Jigsaw Homes Group’s first private rent scheme which resulted in all 67 apartments let by the building’s opening has won an award. Jigsaw Group and Manchester-based design and marketing agency Blaze scooped Best Property and Construction Campaign at the Northern Marketing Awards (14 Nov) for their work to promote Summers Quay in Stalybridge, Tameside. Summers Quay in Stalybridge, Tameside. The development, which was officially opened in September by Jonathan Reynolds MP, has generated a lot of interest with a third of apartments reserved off-plan during an early bird offer in January. Campaign work also attracted the attention of the Greater Manchester Mayor Andy Burnham who visited the site early in the year to launch his Town Centre Challenge which Stalybridge is part of. The community has been involved too with local events and schoolchildren planting a time capsule in the grounds of the building. The mix of one and two bedroom apartments at Armentieres Square are managed by housing association New Charter Homes and offer canal and courtyard views with rentals starting from £575pcm. Tenants are some of the best connected in the country as the building is one of the first residential schemes to be linked up to a full fibre connection through Tameside’s ‘dark fibre’ network. The judges were very impressed with how the campaign demonstrated local engagement, community focus, great results and excellent management of budget. 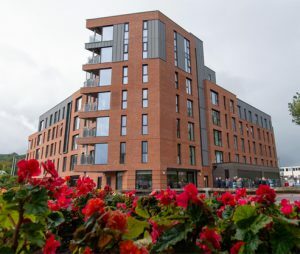 Tony Powell, Deputy Chief Executive at Jigsaw Homes Group added: “Summers Quay is our first private rent scheme so it was important to create a strong and desirable brand backed up by effective marketing and PR which led to the development being fully let by practical completion.